I suppose it would also be irresponsible to note that Patsy Ramsey was born and raised in Parkersburg, West Virginia, a city better known for the Federal Bureau of Public Debt Building, a project located there at the heavy insistence of West Virginia's longtime Senator (and longtime Appropriations Chairman) Robert Byrd. Byrd, it should be noted, is fingered by Cathy O'Brien as one of her main oppressors. He has also been alleged (by an article in a fundamentalist Christian magazine) to be one of the main people behind the formation of Michael Aquino's Temple of Set. Do two rumors equal a truth? 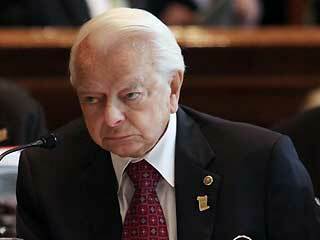 No, but in any case, Senator Byrd is a "former" member of the KKK.